Tools to optimize the Memory Usage of Firefox and Chrome | ComTek Computer Services Inc. Web browsers can use a lot of memory on a computer system. Once you start opening additional websites in tabs you will notice that memory usage is going up. Firefox does a better job at that as Chrome at the time of writing but both can easily go up to 1 Gigabyte of memory usage and more. High memory usage may not be an issue if the system you are working on has plenty of it. If it has 4, 8, 16 or even more Gigabytes of RAM, then you may never run into any memory related issues. Sure, you may dislike how much memory a single program is using on the system but if it is not impacting performance or other operations, there is not really anything to worry about. Internet users who run systems with less RAM, especially 1 Gigabyte and below, sit in a different boat. Their systems may not have enough RAM for all processes running on it which may reduce the overall performance of the system due to caching being used to overcome this limitation. 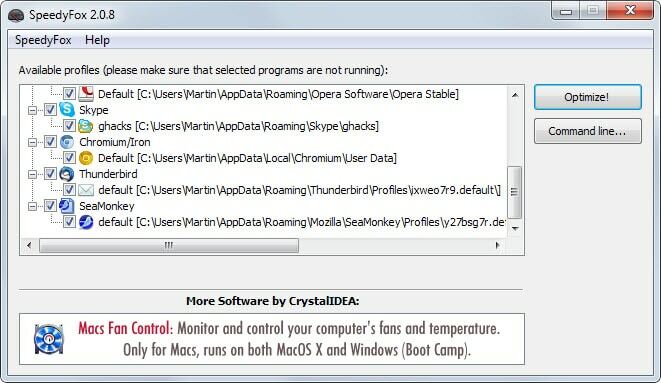 The following list of programs is divided into two parts: browser extensions and programs. The following desktop programs attempts to free up memory using various API calls or techniques. Some may call them snakeoil because of that while others swear that they have a positive effect when they run them on their system. Firemin does not do anything that Windows does not do itself when the system runs out of RAM. It calls the Windows function EmptyWorkingSet over and over again in a loop to free up memory. Calling the function removes as many pages as possible from the working set of the specified process. The effect is temporary which is why Firemin calls it in a loop. It may impact system performance as well depending on how it is set up. The program ships with a slider that you can use to set the desired interval in which you want it to call the function. 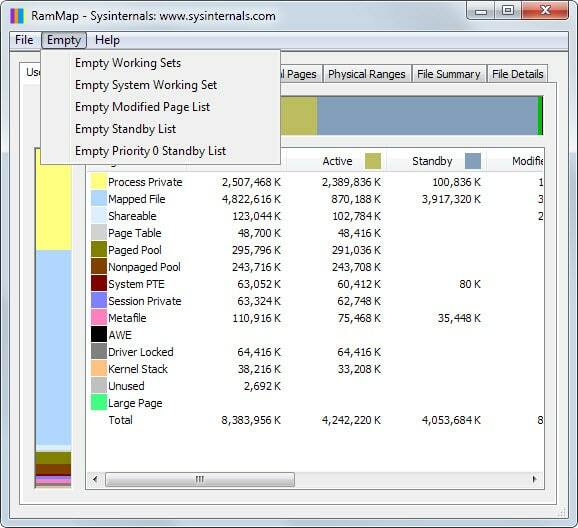 Once it is running, you can see its effect when you open the Windows Task Manager or a third-party process manager such as Process Explorer. RAMMap has been designed to provide users of the Windows operating system with detailed information about how memory is being used by it. It displays process working sets, physical pages and ranges, file summaries and use counts among other things. The program ships with an Empty menu at the top which you can use to free up memory. It offers additional empty options compared to Firemin but does not run those in a loop like the former program does. Another difference is the fact that it will empty them all and not only that of a specific process. 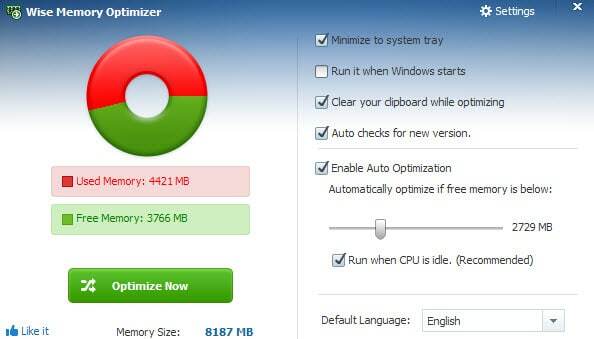 You can configure Wise Memory Optimizer to run automatically when the system's memory count drops below a threshold. 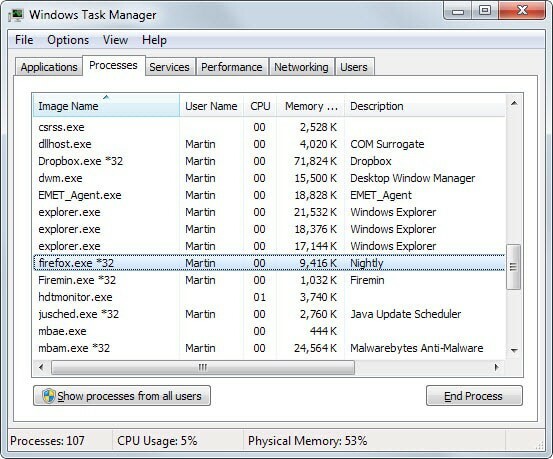 The program itself does not optimize individual processes but overall RAM usage instead. The company does not reveal how it works, but it is very likely that it is using the same API calls as all the other programs that work in a similar fashion. SpeedyFox optimizes Firefox, Chrome and several other programs in a different way. Instead of freeing up memory directly, it will optimize the databases used by these programs instead. This may reduce the size of the database used which in turn may speed up the loading time of it when it is needed and may also reduce the overall memory usage of the program it is used by. These programs work in a similar fashion to the ones listed above. All Browsers Memory Zip supports more than two dozen browser processes. It can free up ram for any of them by setting a desired amount of RAM in the interface. CleanMem runs every 15 minutes to free up system memory. A Pro version is available that offers advanced features, the free version does not offer that many. Memory Booster clears the working set of processes when run. It is created by the same developer as Firemin but works with all processes instead. Minimem displays processes sorted by memory usage in its interface. You can select one or multiple for optimization. Mz RAM Booster will free RAM when it drops below a threshold. The program ships with a selection of tweaks on top of that. RAMRush will optimize the memory when the free amount drops below the 8% mark. Browser extensions and add-ons are installed directly in the web browser of choice. These won't free up memory directly by calling Windows functions but can do so in other ways. FooTab improves the start of Chrome by loading only the active tab when the browser starts while blocking the loading of all other tabs. Blocked tabs get loaded once you select them in the browser interface. The extension is mostly useful to Chrome users who restore sessions whenever the browser starts. This extension provides a frontend for Firefox's about:memory page. Instead of having to open it manually whenever you want to reduce memory usage you can use the menu the extension provides you with instead to do so. 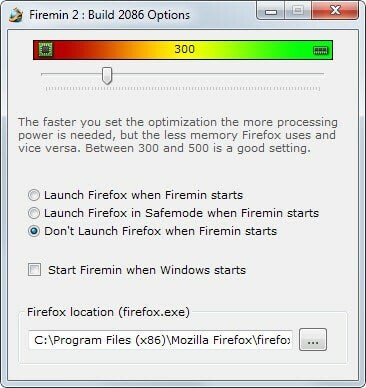 You can set a memory threshold using the extension to have it restart Firefox automatically whenever the selected amount of RAM is reached. 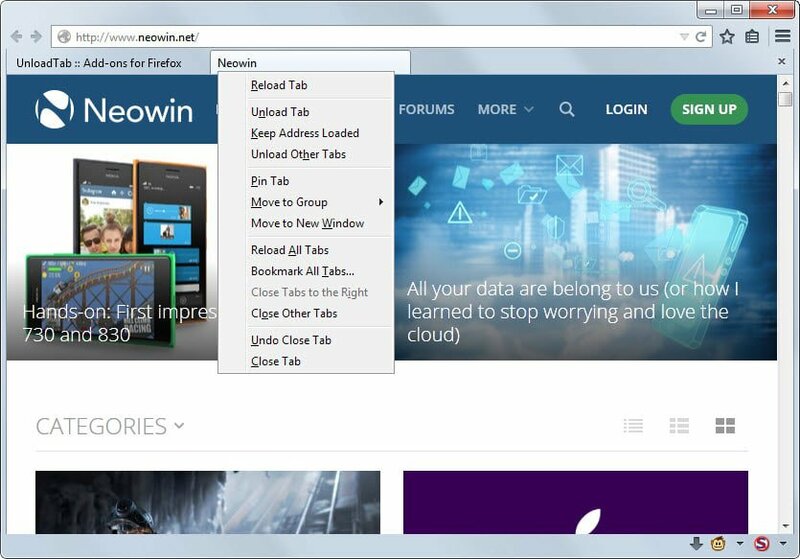 The browser add-on can convert tabs into a list effectively freeing up memory in the process. It may also reduce the load of the cpu depending on whether background scripts have been running in tabs that you have moved to the list. Tab Grenade is a similar extension. The extension moves inactive tabs, those not activated for a set amount of time, to sleep so that they use less memory than before. Suspend one or all tabs of a Chrome browser window. Suspending tabs unloads them in the browser without removing the tab itself. Since tabs, or more precisely the sites loaded in them, consume memory, doing so will free up RAM on the system. The browser add-on for the Firefox browser can unload tabs automatically or manually on user request. It is possible to unload individual tabs or all but the selected tab in Firefox. The add-on ships with settings to control the tab loading behavior of Firefox on start and supports exclusions to block the unloading of select tabs. Suspend Tab is an alternative that works in a similar fashion. Some web browsers offer internal options to clear memory usage or perform other optimizations. Load about:memory in the address bar of the Firefox browser for options to reduce the browser's memory usage. 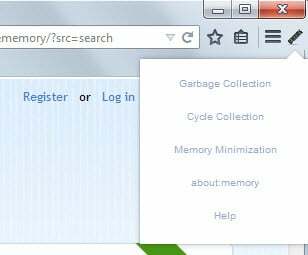 Here you can do a global garbage collection, a cycle collection or minimize memory usage. The page lists the memory usage of Chrome and other browsers that may be running on your system. Note that while it does so, it does not offer any options to purge the memory of the browser.